Tagore had a special relationship with America, where he visited five times during his lifetime and spent the second highest number of days outside India after England. His visits also happened during some crucial junctures in his life and in the history of the world as well as India. He had developed some kind of a fondness for America and Americans that brought him again and again even after being sorely disappointed with his previous visit. It is true that his later trips to America were mostly to raise funds for his school (and later his university) in Shantinekatan, but some of his trips were made when he was very well informed about the potential outcome of this objective. But in this article I do not intend to get into the details of his trips or his relationships with Bengali Americans. Rather, I’ll try to highlight his feelings for America and that too the positive ones by quoting from some of his interviews, statements and letters. 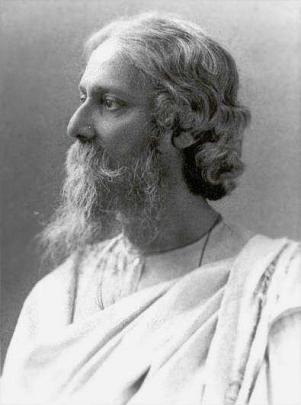 During his next visit in 1916, Sir Rabindranath Tagore was well known to the American people as the first man of the orient to win the Nobel prize for literature. His poems, plays as well as his biographies were already in circulation. But during this trip, when the Great War (WW I) was raging in Europe, Tagore was extremely critical of the western nations as well as of America. But one of the primary reason of his criticism was because he felt that it was only in America where his appeal for humanity hold the best chance of being heard. He said, “This is a beautiful country. I believe it has a great future. America is unhampered and free to experiment for the progress of humanity. Of course, she will make mistakes, but out of these series of mistakes she will come to some higher synthesis of truth and be able to hold up the banner of Civilization. She is the best exponent of Western ideals of humanity.” He had high hopes for America. In New York he said, “America has the figure of youth and all that is best in Western civilization will eventually find lodgment here.” But his criticisms did not make him many friends in America, and the press lashed out at him on several occasions. He knew that he was being too harsh sometimes, and he said, “I am out of place here, I know, and I maybe judging you harshly. I felt I must come to bring the message of the East… This is my only happiness in America – the thought that this country can be the meeting place of the two (the East and the West).” Overall this trip was very successful for Tagore and he had high regards for President Woodrow Wilson. He wanted to dedicate his book “Nationalism” to President Wilson. However President Wilson’s office declined the offer on the advice of Sir William Wiseman, Britain’s special liaison agent in the United States, who reported that Tagore had “got tangled up in some way” with the Indian revolutionaries in America who were conspiring with Germany to overthrow British rule in India. Later in 1918, Rabindranath was falsely implicated in the famous Hindu German conspiracy trial. When Tagore came to know about this he was very upset and immediately sent a telegram to President Wilson protesting the allegation. Later he wrote Wilson a letter in which he stated, “I have received great kindness from the hands of your countrymen, and I entertain great admiration for yourself who is not afraid of incurring the charge of anachronism for introducing idealism in the domain of politics, and therefore I owe it to myself and to you and your people to make this avowal of my faith and to assure your countrymen that their hospitality was not bestowed upon one who was ready to accept it while wallowing in the sub-soil sewerage of treason.” President Wilson’s office never replied to this letter. Tagore last trip to USA was in 1930 on his way back from Russia. This time the reception was not that cold as his previous two trips. Although he suffered a minor heart attack and was in ill health for a prolonged period, he managed to make some important engagements including a meeting with President Hoover at the White House. Most of his lectures were very well attended, but it was the time of the great depression in America, hence his fund raising was not successful as expected. Rather, he donated the entire proceedings from the farewell event held at the Broadway Theatre on December 14, 1930 to the relief fund of the New York City’s unemployed. The gesture was typical of the person who had tried all his life to call attention to the needs of the India’s millions and who, in bidding farewell to America’s millions thought first of helping those during their time of need. Rabindranath Tagore has criticized the American’s like one criticizes his own brother. But he never lost his faith in America. He believed that it was America who can uphold the cause of humanity against the barbarism of western nationalism. The ultimate hope and trust he had on America was expressed in his telegram to President Franklin D. Roosevelt in June 1940 when the fire or World War II was raging in Europe. In 1941, a few months after Tagore’s death at the age of eighty, the United States threw its weight into the war which destroyed the Axis powers. Thanks for sharing a brief history of Tagore in America. It is surprising how little the topic of Tagore’s visits to America was a part of the Tagore narrative that I grew around in Calcutta (and believe me, being from Patha Bhavan school, I was around a lot of Tagore loving people!!) I look forward to reading more on this topic. Two new plays on related topics are coming up soon. Stay tuned.